Artificial and machine learning have undoubtedly continued to gain momentum and revolutionize a variety of industries. Within cybersecurity, AI has the power to bring complex reasoning and self-learning by automated means on a larger scale, helping to reduce countless permutations and increase resistance. Artificial intelligence can enable more efficient jobs, those less prone to errors in the manufacturing world. It’s greatly affecting the health services industry, with computer vision helping to show disease and machine learning showing promise to find patterns in the population. For construction companies, AI and machine learning will make processes faster, safer, and more cost-effective by reducing human error and utilizing big data. As you can see, AI has a ton of potential for a wide range of jobs and industries. But one less discussed industry that AI is also penetrating is that of visual arts. Just last October, auction house Christie’s sold a painting that was created by a machine for the first time ever. And that painting sold for over $400,000 though it was originally projected to sell for closer to $10,000. Shortly before, a contemporary art gallery in New Delhi held an entire exhibition dedicated to AI art and artists. The AI has a ton of potential and endless capabilities in a field of art, and they’re expanding to a variety of visual arts including fine art, culinary arts, literature, music, and dance to name a few. Below are examples of how artists are collaborating with machines to go beyond that of typical art methods. IBM’s Chef Watson is a cognitive computing application that processes information much like a human. The machine will have the ability to mimic the work of a chef in the kitchen and advise humans on food combos. Aside from machines writing books, other AI artists are exploring another potential of artificial intelligence in the literary world, using neural networks to generate poetry, screenplays, and literary travel fiction. In 2017, the world’s first album composed and produced by AI was released. It features an artificial intelligence music composer, producer, and performer developed to work in collaboration with human musicians. Choreographers are exploring ways to introduce AI within dance, generating their own independent choreography based on hundreds of hours of video footage machines have been fed. The above examples are just a few ways in which AI is penetrating the art industry, and through extraordinary in their capabilities, it raises a slew of questions from both artists and collectors alike. “Who owns the art?” “Do machines have the ability to think as creatively as humans?” These are questions that come with a variety of answers and opinions. Artists that are in favor of AI feel they can use machines to enhance their creative abilities and push the boundaries in a collaborative way. Mario Klingemann, one of the pioneers of leveraging artificial intelligence in art, explains, “…a machine enables you to forcefully provoke that. Because it’s much easier to glitch, or bring off course, than a human brain. In the process of doing that often, some interesting things happen which are unexpected.” But those not in favor of AI fear it will take away from the creative process and argue that machines limit the ability of an artist to think creatively, worrying that they will be replaced in the future as well. Would you buy a piece of artwork you knew was created by a machine? 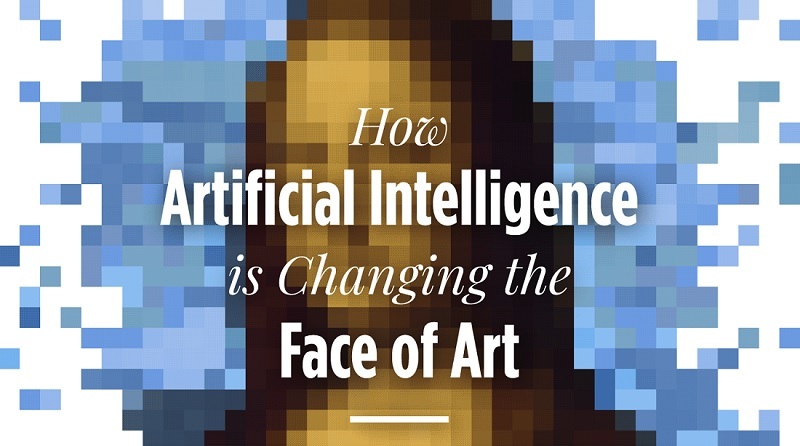 You can check out the following Infographic developed by Invaluable, that explore artificial intelligence in art, and dive deep into the more serious questions that have arisen with this new movement.